This is actually a rather old picture that I’ve been holding onto. 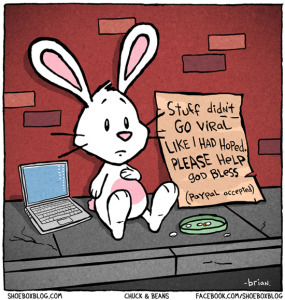 I couldn’t figure out if it was PG enough for QC, but ultimately, it *is* quirky and it *is* a bunny, so I had to. The alternative was for me to try to recreate the photo myself and I’m pretty sure nobody wants to see that attempt, lol. And as a true meat eater, I couldn’t justify trying to pull off saying things like “Vegan meals are healthy, humane, and helpful to the environment, so they’re something everybunny can enjoy!” *cringes at the lameness* Still a great photo, though! Is it wrong that I kinda want these? For other people, I’m sure these would only make an appearance at Easter time as a novelty item. In case you haven’t noticed, I kinda do the bunny thing year round. The only downside would be that I don’t actually use salad servers. Which means there’s no doubt in my mind that these would be brought out when all the dishes are dirty. Solo. 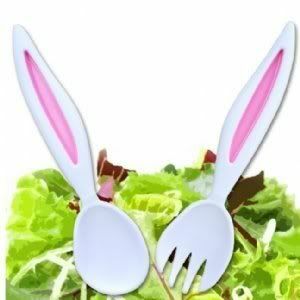 Each used as a extra large bunny ear eating utensil. I wonder if I should tuck the other in my pocket as a good luck charm.